65 Pounds Down in Five Months! And so begins week number 21 of my switch to a plant based diet and increased exercise regime. This week I lost an additional 4 pounds! That brings the total to 65+ pounds in just five months. What a ride this has been so far. Emotionally its like a roller coaster. The plateaus are coming now about every 10 pounds or so and they can really be a bear at times. The last one played havoc with me for nearly three weeks. I have redoubled my efforts though and have seen a great deal of movement after cutting out wheat, stopping my late night snacking and steering away from my occasional cheat meals until I make my way under the 300 pound mark. I’m finally getting to the point where I’m starting to feel comfortable in my own skin again. I’m not there yet but it is within reach. I can feel the physical and mental switch within the last week. I look back at when I topped 400 pounds and almost find it unfathomable. How the heck did I let things spin that far out of control? It wasn’t long ago yet in ways, it seems like a lifetime. I continue to receive really nice words of encouragement from you and I am very thankful for that. Your words are inspiring and the information that you send is helpful. That some of you take the time to send me an email with your thoughts and reflections on what I have written means so much. Complete strangers, some from half way around the world reaching out with messages of hope. It helps to restore my faith in humanity and makes me feel like I’m doing something worthwhile here. Without you I am positive that this struggle would be exponentially more difficult if not abandoned alreeady. So this week, I’m enjoying my Vitamix juicer/blender. I’ve decided to eat RAW foods meals at least twice a day this week and the Vitamix has gotten me off to a good start. Tonight I’ll be making some soup. Last night I got a little creative and made a smoothie with broccoli rabe, apple and pineapple, garlic, bell pepper, jalapeño, scallion, tomato and cucumber. The pineapple was a last minute addition after tasting it and realizing it needed something else to lighten it up some. An interesting mix of flavors but it definitely worked. This is a whole new world for me so if you have a Vitamix and/or enjoy juicing, post up some tips here or drop me a line at johnnysized@gmail.com. Enough people have asked me what a typical week of eating plant based foods looks like so I’m going to give you a rough example of mine. As I mentioned yesterday, I’m a creature of habit so this may not offer enough variety for some. But truly, your week’s menu is only limited by your imagination. With the internet, it’s never been easier to go plant based. There are tons of sites for recipes out there. Eat the plant based foods that you like and start building from there. Eating this way, takes time. On a sunday night, it can take up to 90 minutes to prepare veggies to have for lunch that week. It can be a pain but it is worth it. Don’t forget your B12 supplements! Breakfasts – Cheerios! There are healthier cereals out there I am sure but I’ve always liked these since I was a little guy. I can eat them dry on the go or with coconut milk (I have the unsweetened stuff, try it for a week, you will get used to it). Organic Steel Cut Oats is another option. Raw vegetables or grilled / sauteed zucchini (one of natures most perfect anti-inflammatory foods is the perfect way to start the day). Breakfast is a good time to have fruit. Many mornings I will have a veggie wrap….with mustard! Lunches – Wraps – I love them (although I admit it’s getting a little old lately). A raw veggie salad with a mustard and balsamic dressing (I go through an amazing amount of lettuce each week). Cabbage, broccoli rabe, lentil or split pea soup. Vegan pad thai or another one of Dr. McDougall’s packaged vegan meals (found in many health food aisles in the grocery store, I try to limit the processed stuff but this doesn’t seem too bad and low sodium options are sometimes available). Sometimes hummus or baba ganoush. Stack of tomato slices with layered basil (I most often go oil-less). Broccoli slaw. Snacks – raw veggies (peppers, string beans, carrots, cucumbers and/or celery (a negative calorie food). Fruit – an apple a day…., seeds and nuts. Dry roasted edamame (I live on this stuff – high in protein and fiber but not fat). Dry roasted chick peas and similar snack foods can be found at your local Wegmans, Whole Foods or health food shops. Vegan pumpkin muffins, homemade vegan fruit bars. Dinners – Vegan stuffed peppers with ground soy “meat”, brown rice, quinoa, beans, corn and tomato sauce (make 4 at a time and get several meals out of it). vegan tacos or taco salads. Soups and salads. Black beans (or other) with hot sauce and liquid smoke (a great simple, quick and tasty way to get your protein and fiber). Pasta is an awesome treat when eating this way (just check the labels). Grilled veggie sandwich on crusty italian bread (I’m limiting my bread but this is too good to pass up once a week). Veggie burgers or similar products like chik’n nuggets, hot wings, etc. (read the labels) about once a week for a little variety. Veggie stir fry. Sautéed veggies in veggie broth. Give it a try for three weeks and see how you feel. 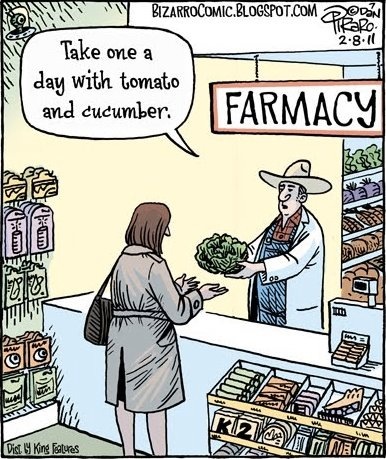 I’m willing to bet that if you go completely plant based for three weeks , by the time you are done you will have lost weight, and feel a whole lot better with increased energy and well-being. And if you find that it is not for you, at least your body will be thankful. You can do totally do this, if you put your mind to it. Finally hit the 50 pounds of weight loss mark yesterday. The last 10 pounds were shed a lot slower than the first 40 but that is to be expected. The next 50 will be harder but also easier than the 50 pounds that comes after that. I’m going to get there eventually. So what did I do after achieving my mini goal? I rewarded myself with Taco Bell. I actually used food as a reward. This is the sort of thinking that got me into the predicament of needing to lose so much weight to begin with. Old habits really do die hard. If I was going to have meat, it would have been smarter to actually eat something more authentic than whatever it is that passes for meat these days at Taco Bell. In the end it wasn’t so good and I felt disappointed with myself (and a little bit sick to my stomach) when it was over. The scale remained kind to me this morning though, which I was very thankful for. Today it was back to vegetables. Wraps with broccoli rabe, bok choy, squash, onions, mushrooms and mustard sprouts! And they honestly tasted better than my Taco Bell binge last night. It’s okay to fall once in a blue moon as long as we pick ourselves up and get back on the road to wellness. Getting it out of my system may not have been the worst thing for me. I had a craving and now I see that I really wasn’t missing much. 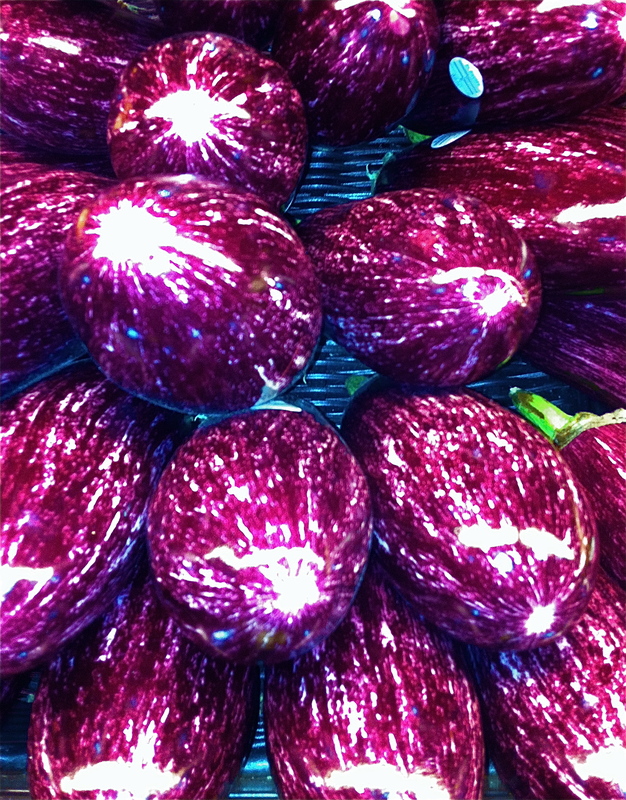 Beautiful “Graffiti Eggplants” found in my local produce aisle! So the Broccoli Rabe soup came out fantastic. As I tried it, I was thinking of how much my mother and grandmother would enjoy it. My mom stopped by today and tried a little and told me it was some of the best soup she has ever had. Success! This soup is hearty! I love cajun food and recently came across this recipe. I’m hoping to give it a try soon! It would have been perfect for Fat Tuesday! In a large pot over medium-high heat, sauté the onions, pepper, and celery in the olive oil. When the onions begin to get translucent, add the flour and stir continuously, scraping the bottom of the pan, until the flour begins to brown slightly. Add the vegetable broth and tomatoes, stirring to combine. Then add the remaining ingredients. The gumbo should have enough liquid to resemble a chunky soup; if it is too dry, add some more vegetable broth or water. Cook for at least 30 minutes, until the flavors have a chance to mingle. Remove the bay leaves and serve over rice. Veggie sausage can also be added! That’s it for today, Brother Body wants some rest now! And the Train Kept Rolling…. And so begins week 9 of my switch to a plant based diet. I lost a pound this past week. That brings the total to over 46 pounds lost through diet, exercise and sickness. I wasn’t thrilled with the weight loss this week. I pushed myself to try to lose 5 pounds so that I could hit an even 50 pounds within 8 weeks and I ended up falling short. I gave it a good effort but it just didn’t happen. Maybe this is my ego needing big round numbers. I should be content with just continuing to lose the weight. In my mind I think it makes a good story to lose 50 pounds so quick. But the real story is this – losing weight is hard and its really #$&*! @ frustrating at times. You think you’ve found your personal formula for success and then weight loss slows down dramatically or stops all together. I didn’t even want to write this blog today because I was so aggravated. I knew that five pounds in a week was not going to be easy but I felt that with some discipline it could be done. I came up with what I thought was a good game plan. I tried to switch the week up by cutting back the amount of plant based fats I was taking in but honestly it just left me hungry. I increased my fiber and protein intake but still hungry… Miserably hungry for the last four days and the scale barely moved when all was said and done. So I need to work harder, especially physically, if I’m going to be able to sustain the kind of weight loss that I’ve been seeing up until this point. I really hope my dumbbells I ordered get here soon as I’m eager to throw them around and I’m starting to hate the treadmill with a passion. It really is becoming “the dreadmill”. At least nice weather temps are around the corner which hopefully means a few days walking around the park which will be a pleasant change of scenery. So after days of feeling overly hungry, tonight I did something counterintuitive. I went to the local buffet. It’s been two months since I was there and I definitely can’t put it away like I used to nor did I even want to try. I did enjoy a nice vegetable stirfry and some sushi. I also had some shrimp. I feel like my body has been craving meat so I allowed myself a little bit of seafood. There is definitely some sort of meal with beef in my future. I thought about tying it a 50 pound weight loss as a reward. But that sort of thinking got me into this predicament. Food shouldn’t be a reward, at least not for me, not now. So yeah, dreaming of beef, even if it is just a piece or two. For now, I’m just going to increase the B12. What I did find interesting is that things I would normally get there, like coconut chicken, just weren’t appealing to me in the least. And if I’m going to eat beef, it’s going to be some place good and not at a buffet. 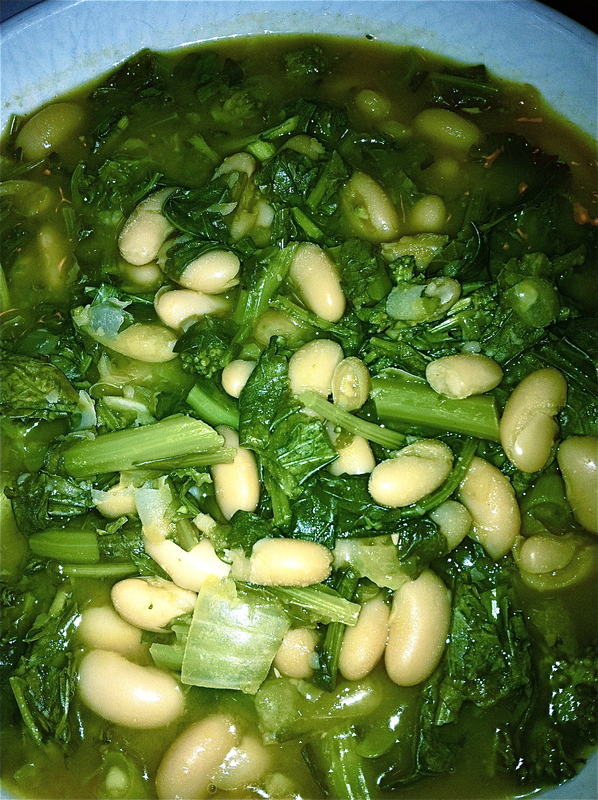 I’ve got the broccoli rabe soup in the slow cooker. It’s been going all day and it smells sooooo good. Pics tomorrow. I’ve been eating an awful lot of veggie wraps lately and they have been delicious. 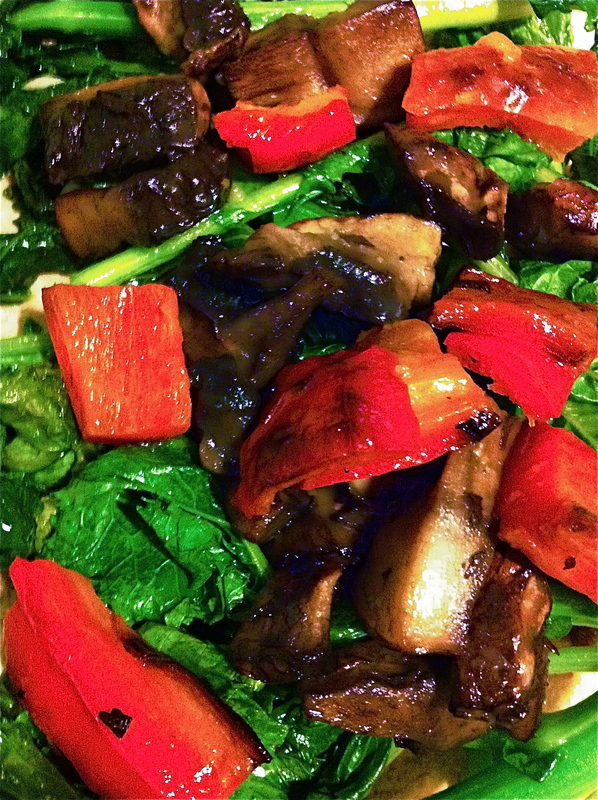 I’ve enjoyed all sorts of variations of peppers, bok choy, broccoli rabe, mushrooms, lettuce and sprouts. Here’s a pic of the veggies that were going into one of my recent wraps. Doesn’t that look fabulous?! The wraps themselves have been high in fiber while low in fat and calories. But my weight has leveled a bit and I need to switch it up and get some more variety this week. I’ve recently got a hold of some wonderful plant-based cookbooks that are giving me some excellent ideas. In the northeast US right now, it’s fairly cold. And nothing beats the chill like a nice warm homemade bowl of soup. I’m looking for something different though and I think I’m going to give this a try and see how it goes: Broccoli Rabe Soup! I don’t know what it is about Broccoli Rabe but I am just absolutely crazy for the stuff. Through the course of last week, I ate three heads of it. I know, I just said I need to switch it up, but I’m not letting go of my Broccoli Rabe! I’m going to add carrots and onion chopped very finely, lots and lots of garlic, mashed white beans as a thickener and then add some seasoning to my veggie stock. I’m going to let that simmer for a few hours and then add trimmed and chopped broccoli rabe! I imagine you could substitute escarole, spinach or kale if you prefer one of those. I’m also going to make a Roman-Style Marinated Broccoli Salad. It’s really quick and easy. You take a package of broccolislaw (big time saver), add 3 chopped plum tomatoes, extra virgin olive oil, red wine vinegar and season to taste. Combine, sprinkle with a bit of parsley and then refrigerate for several hours. This will be a really nice side salad to that soup. I can’t wait to make these. I’ll let you know how it goes. Pics to come! And so begins week 6 of a plant based diet. I’m down an additional two pounds which makes the total loss so far 37 pounds+. I was hoping to lose more this week but every ounce down is a step in the right direction, so I will take what I have gotten. The last time I really seriously tried to lose weight, I shed 65 pounds in no time. That was about 10 years ago. It is true what they say about aging and metabolism. More importantly than the weight loss is the way I feel. I definitely feel healthier, have more energy and am comfortable continuing on this pace. Slow and steady wins the race. I’m in this for the long haul. Mentally, I’m already there. There was a switch that happened in my mind when I decided to go on this path and I can no longer envision myself living any other way. There is no giving up or long term discouragement. There is only faith in reaching the goal. After many failures in the past, failure is no longer an option. Sure I have and will stumble from time to time but I will pick myself up, dust myself off and proceed on. I remain undeterred. Yesterday I had to cut a new hole into my belt because the belts I have are now too big. It won’t be long until I need the next size smaller pants. These are good dilemmas. Last night I dreamt of broccoli rabe. This is my new normal. Wakan Tanka, Great Mystery, teach me how to trust my heart, my mind, my intuition, my inner knowing, the senses of my body, the blessings of my spirit. Teach me to trust these things so that I may enter my Sacred Space and love beyond my fear, and thus Walk in Balance with the passing of each glorious Sun. Also please notice that in the upper right hand corner of this page is an email sign-up so that you can be notified of all updates to this page.